Earthquake. Fire. Hurricane. Tsunami. Genocide. War. Famine. Hardly a day goes by that one does not hear of a disaster of some kind that is happening in our world. We listen to the news, we are concerned, we pray, we donate, we try to give relief. Then the 24-hour news barrage moves us on to the next big news story and the cycle starts all over again. Until we become slightly numb to devastation. While we may quickly move on with our lives after a disaster strikes, those directly affected by it may feel the devastation for many years to come. Eight years ago, Rosa was living in the mountains outside the city of Santa Ana, in El Salvador. Her eldest son, Carlos, was already sponsored through CFCA. The family was getting by on a meager income that Javier, Rosaís husband, brought in through agriculture, and a small garden that Rosa enjoyed tending. Rosa stayed at home to tend to the children and to take food to her husband in the field. Then, in January 2001, an earthquake, registering 7.6, destroyed their† home. 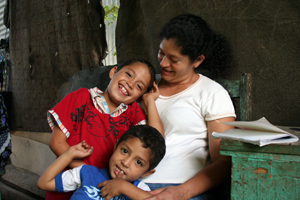 Rosa and her family slept outdoors for many nights and then went to stay with her brother. Rosa, Javier and their three children, her parents, and her brother and his family of four moved to an area in Santa Ana that had been designated for earthquake victims. There they built a small home from scrap metal that they found. Rosa finds life in the city to be much harder and more expensive than in the country. She now has to buy the vegetables and beans that before she had grown herself, and she buys less of everything because food prices have increased. Where she used to buy one pound of rice, now she buys half a pound. She is, however, very grateful for the nutritional supplements her family receives as a benefit through CFCA. She also misses the community in her old village. Rosa now earns a living by going to othersí homes and washing their clothes. Javier works as a bricklayer in the capital, San Salvador. He tries to come home every three days to see his family but the transportation expenses are high, averaging $4 a week. The family prays every night for Carlosí sponsor. They also pray that the other children in the family receive sponsorship. In September Rosaís 9-yearñold son, Bryan, received sponsorship. Godís answer to her prayers. Update: At the time of this posting, Carlos, 14, is no longer in the sponsorship program. He decided to leave the program to find a job. Rosaís youngest son, Cesar, 3, has been sponsored in his place.